As the terminology indicates, the SCR is a controlled rectifier constructed of a silicon semiconductor material with a third terminal for control purposes. Silicon was chosen because of its high temperature and power capabilities. The basic operation of the SCR is different from that of an ordinary two-layer semiconductor diode in that a third terminalÂ called a gate, determines when the rectifier switches from the open-circuit to short-circuit state. It is not enough simÂ­ply to forward-bias the anode-to-cathode region of the device. In the conduction state the dynamic resistance of the SCR is typically 0.01 to 0.1 ohm and reverse resistance is typically 100 kilo ohm or more. It is widely used as a switching device in power control applications. It can control loads by switching on and off upto many thousand times a second. It can switch on for a variable lengths of time duration, thereby delivering deÂ­sired amount of power to the load. Thus, it possesses the advantage of a rheostat as well as a switch with none of their drawback. 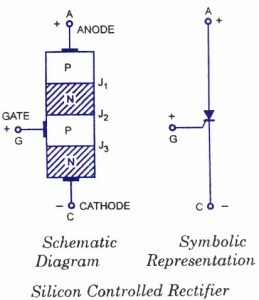 A schematic diagram and symbolic representation of an SCR are shown in figures a & b respectively. As illustrated in fig-a, SCR is a three-terminal four-layer semiconductor device, the layers being alternately of P-type and N-type. The junctions are marked Jj, J2 and J3Â (junctions Jj and J3 operate in forward direction while middle junction J2 operates in the reverse direction) whereas the three terminals are anode (A), cathode (C) and gate (G) which is connected to the inner P-type layer. The function of the gate is to control the firing of SCR. In normal operating conditions, anode is positive with respect to cathode. From fig a it is clear that SCR is essentially an ordinary rectifier (PN) and a junction transistor (N-P-N) combined in one unit to form PNPN device. 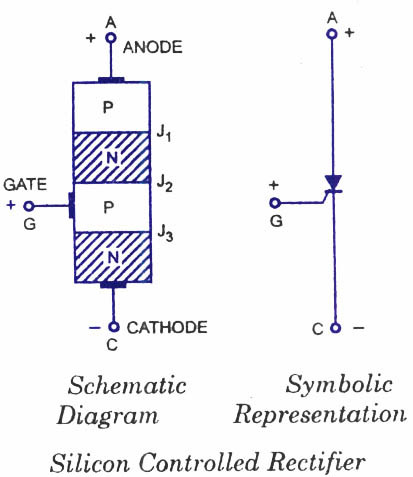 Three terminals are taken: one from the outer P-type material, known as anode, second from the outer N-type material, known as cathode and the third from the base of transistor section known as the gate. (iv) less leakage current in P-N junction. It consists, essentially, of a four layer pellet of P and N type silicon semiconductor materials. The junctions are diffused or alloyed. The material which may be used for P diffusion is aluminium and for N diffusion is phosphorous. The contact with anode can be made with an aluminium foil and through cathode and gate by metal sheet. Diffusion must be carried out at a proper temperature and for necessary duration to provide correct concentration because this decides the properties of the device. Low power SCRs employ the planar construction shown in fig a. Planar construction is useful for making a number of units from a silicon wafer. Here, all the junctions are diffused. The other technique is the mesa construction shown in fig.b. This technique is used for high power SCRs. In this technique, the inner junction J2 is obtained by diffusion, and then the outer two layers are alloyed to it. The PNPN pellet is properly braced with tungsten or molybdenum plates to provide greater mechanical strength and make it capable of hanÂ­dling large currents. One of these plates is hard soldered to a copper or an aluminium stud, which is threaded for attachment to a heat sink. This provides an efficient thermal path for conducting the internal losses to the surrounding medium. The uses of hard solder between the pellet and back-up plates minimises thermal fatigue, when the SCRs are subjected to temperature induced stresses. For medium and low power SCRs, the pellet is mounted directly on the copper stud or casing, using a soft solder which absorbs the thermal stresses set up by differential expansion and provides a good thermal path for heat transfer. For a larger cooling arrangement, which is required for high power SCRs, the press-pack or hockey-puck construction is employed, which provides for double-sided air for cooling. The salient features to be considered, while designing an SCR, are the diameter and thickness of wafer, composition of the base material, type and amount of the material to be diffused into the wafer, shape, position and contact area of the gate, shape and size of the SCR, type of heat sink etc. Fabrication technology determines various properties of the device. The voltage rating of a device can be increased by lightly doping the inner two layers and increasing their thickness. But due to this increased resistance, forward voltage drop increases and large triggering currents are required causing greater power dissipation accompanied by smaller current ratings. The heat dissipation of silicon falls from 1.5 W/cm2 at 25Â° C to 1.25 W/ cm2 at 125Â° C. A high voltage power device can seldom be used beyond 125Â° C.
The current carrying capacity and voltage rating of the device can be increased by irradiating silicon with neutrons. The current rating of the device can also be increased by reducing the current density at the junction but this result in a bulky device with large turn-on time.